The idea for the Cultural League to organise an art exhibition was conceived many years ago but since 2010 we were in the fortunate position to make this dream a reality thus fulfilling another aspect of the primary aims of the Cultural League. The main purpose of the exhibition is to promote the visual arts within the Greek community and giving artists the opportunity to show their work to a wider public. The crystallisation of holding an art exhibition arose in 2010 during the work of putting together the “Antipodes” periodical. This is the annual bi-lingual literary periodical of the Greek Australian Cultural League of Melbourne. 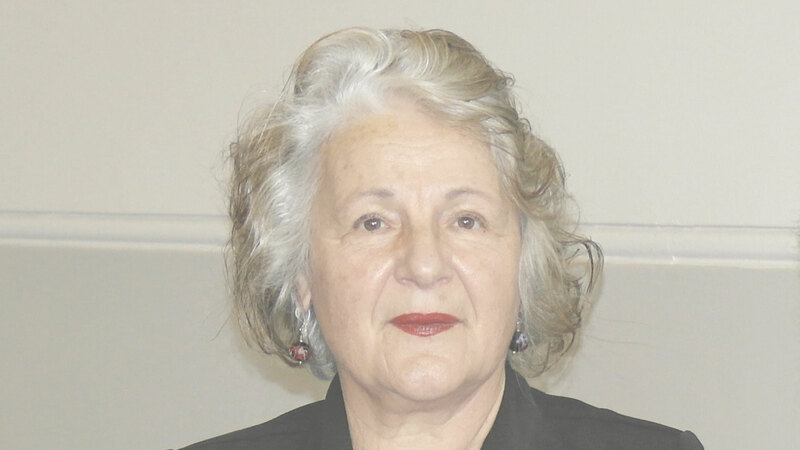 In addition to literature, the magazine publishes articles in English or Greek and it addresses a range of cultural issues which are of particular interest to Greek Australians. The governing body of GACLM was unanimous in its decision to extend its activities to the visual arts, starting with a group exhibition in 2011. This group exhibition has become not only a focal point in the events calendar of the Greek-Australian community but also a ten day celebration of culture at its best-during the exhibition we also hold a book launch, a bi-lingual poetry afternoon, a musical afternoon and other events that may arise. 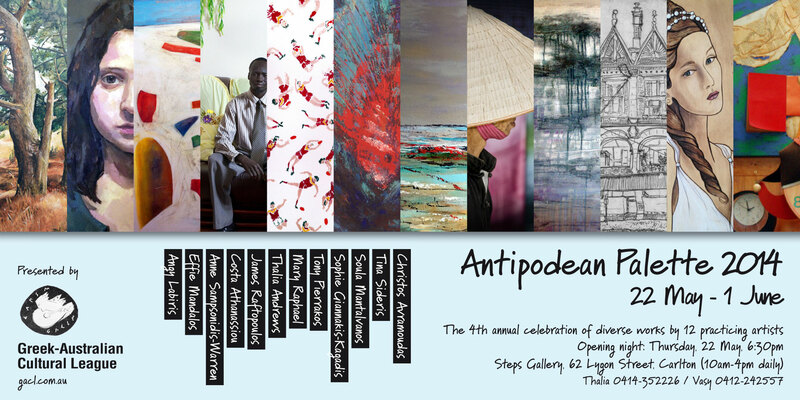 In 2013 the “Antipodean Palette” was officially opened by the Victorian Minister for the Arts, The Hon. Heidi Victoria with guest speaker Anna Pappas, President of the Australian Commercial Galleries Association. This year (2014) we are very fortunate to have Professor Nikos Papastergiadis from Melbourne University’s School of Cultural Studies launch our event. We have taken the opportunity during the opening night of the “Antipodean Palette” to have a musical interlude by different musicians and singers. We have been very fortunate to have showcased the wonderful work of – Christina Alonefti, Anthea Sidiropoulos, Pavlos Andronikos, Irine Vela and this year “PolyΧeni”. It is wonderful to see the various media used creating diversity and sometimes cross-cultural influences that fuse together to produce such a remarkable “Antipodean Palette”, a tapestry of true artistry. I would like to congratulate and sincerely thank all the 12 participating artists for supporting this venture and entrusting the League in exhibiting their “creations”. Thank you for your devotion and commitment to your art form. I can assure you that the GACL is already making plans for our next exhibition and will continue to support your personal outputs and of course the work of those artists who could not be included in this exhibition.